My SCO 5.0.2 system will not boot. 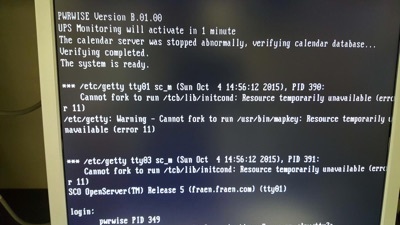 Error messages on the screen include /etc/getty cannot fork to run //tcb/lib/initcond: Resource temporarily unavailable (error 11) and cannot fork to run /usr/bin/mapkey: Resource temporarily unavailable (error 11). This is is the third time I've seen this and it truly astonishes me that anyone is still running this ancient software. I don't know if this comes from a BIOS issue in the old hardware these run on or from the old SCO Unix software, but it is related to the date. The solution is to enter an August 2015 date when the boot asks for it. Then, after login, you can run /etc/asktime again or enter the date with something like "date -t 20151005hhmm.ss; setclk -r". That should get you going until you reboot again. Note: one customer said he had to reboot after doing this and then all was fine.